India said today that it regretted the way Pakistan conducted the meeting between Jadhav and his family, asserting that it violated the letter and spirit of understandings. NEW DELHI: Before being let in for meeting Kulbhushan Jadhav at the Foreign Office building in Islamabad, Pakistani authorities made his wife and mother remove their mangalsutra, bangles and bindi and also made them change their attire, India said on Tuesday, slamming the meeting conducted across a glass panel as "lacking in credibility" and "intimidating". on Monday after 22 months, since his arrest by Pakistan on charges of spying. The face-to-face meeting was conducted across a glass wall and the two sides spoke via a telephone speaker. Avanti, who is in her 70s, was also prevented from speaking to her son in her mother tongue. Every time she lapsed into Marathi, she was stopped and made to speak in Hindi or English, as a senior Pakistani official of the India Desk monitored the interaction. "Under the pretext of security precautions, the cultural and religious sensibilities of family members were disregarded. This included removal of mangalsutra, bangles and bindi, as well as a change in attire that was not warranted by security. "The mother of Shri Jadhav was prevented from talking in their mother tongue, although this was clearly the natural medium of communication. She was repeatedly interrupted while doing so and eventually prevented from proceeding further in this regard," India said in a statement. The footwear of Jadhav's wife was also taken away and not returned. 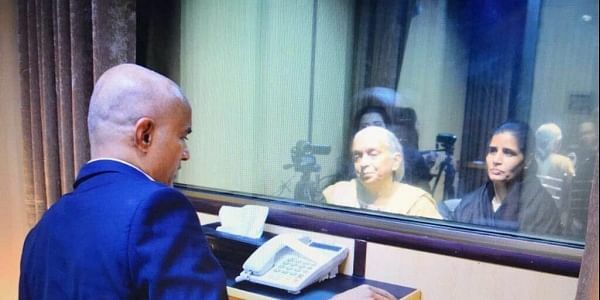 "For some inexplicable reason, despite her repeated requests, the shoes of the wife of Shri Jadhav were not returned to her after the meeting," India said, and warned "We would caution against any mischievous intent in this regard". The Pakistani media also hurled invectives at the two women outside the Foreign Office building. "The Pakistani press was allowed on multiple occasions to approach family members closely, harass and hector them and hurl false and motivated accusations about Shri Jadhav. This was despite a clear agreement that the media would not be allowed close access," the statement said. "Deputy High Commissioner was initially separated from family members who were taken to the meeting without informing him. The meeting was started without his presence and he could join only after pressing the matter with concerned officials. Even then, he was kept behind an additional partition that did not allow him access to the meeting as agreed," the statement said. India also voiced concern at the appearance of Jadhav and his well being, remarking that he looked as though he was "under considerable stress" and was "speaking in an atmosphere of coercion" and that his statements "were clearly tutored" and designed to "perpetuate" Pakistan's allegation that he was a spy and involved in terrorism. "From the feedback we have received of the meeting, it appears that Shri Jadhav was under considerable stress and speaking in an atmosphere of coercion. Most of his remarks were clearly tutored and designed to perpetuate the false narrative of his alleged activities in Pakistan. His appearance also raises questions of his health and well being. "We also regret that contrary to assurances, the overall atmosphere of the meeting was intimidating insofar as family members were concerned. Family members, however, handled the situation with great courage and fortitude. "The manner in which the meeting was conducted and its aftermath was clearly an attempt to bolster a false and unsubstantiated narrative of Shri Jadhav's alleged activities. You would all agree that this exercise lacked any credibility," India said. "There were clear understandings between the two sides and the Indian side scrupulously abided by all its commitments. "However, we note with regret that the Pakistani side conducted the meeting in a manner which violated the letter and spirit of our understandings," India said, listing out the way the meeting was conducted and the manner in which the two women were treated. After the Monday meeting, the Pakistan Foreign Ministry had released a video message of Jadhav - as part of a propaganda offensive, in which Jadhav thanked Islamabad for the "grand gesture" for allowing the meeting. "I requested a meeting with my wife and mother and I am thankful to government of Pakistan for this grand gesture," he said. In the video Jadhav is shown as saying that "he worked for Indian intelligence agency RAW" and that he entered Pakistan through Iran. Jadhav also said that he was arrested by Pakistan's security agencies from Balochistan. Pakistan has said that the meeting does not mean any change in Pakistan's stance regarding Jadhav.